Owls at Turbary Woods Owl and Bird Of Prey Sanctuary in Lancashire. This is Knowley, a Tawny Owl, she was rescued on the 4th May 2007, she had fallen from the nest as the ivy had been cut away from the oak tree, and she and her siblings had all fallen out. She had to be hand fed and as such became imprinted, she is now used on our flying display and educational talks. The Tawny Owl (Strix aluco) is a medium-sized owl, 37–43 cm in length with an 81–96 cm wingspan, which is common in woodlands across much of Eurasia. 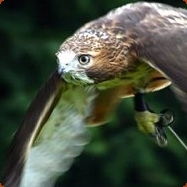 Its underparts are pale with dark streaks, and the upperparts are either brown or grey. The nest is typically in a tree hole, but will also use old Magpie nests, squirrel dreys or holes in buildings, and readily takes to nest boxes. The eggs and young are fiercely defended against potential predators. Harry is a baby Spectacled Owl and is one of the latest additions to Turbary Woods. This is Shaggy, our Great Gray Owl, he is one of the stars on our flying display. The Eurasian Eagle Owl - Bubo Bubo is the largest of all the owls found in Europe, it was a native of Britain until the latter part of the 19th Century. The baby Asian Brown Wood Owl is one of the latest additions to Turbary Woods. This is Lilo, a 3 year old male barn Owl. 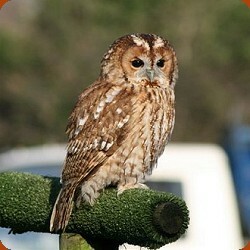 Lilo was bred in captivity in Wales and has twice flown off from Turbary Woods. This is Oink, the female partner to Boink, she is a mature Snowy Owl.